My grandmother celebrates her 90th birthday today, and my father traveled to India to celebrate with her. 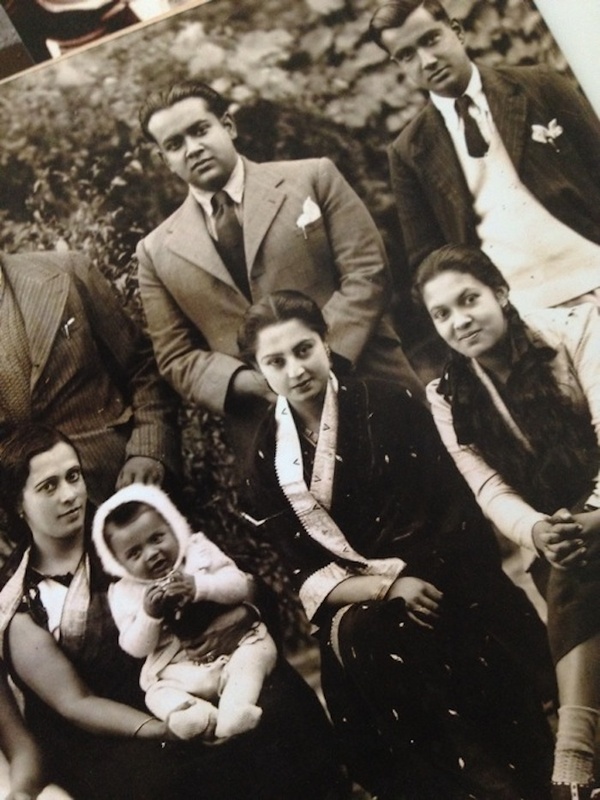 In the photo above, my grandmother is in the middle, with my grandfather behind her and my dad (the baby) on my great aunt's lap. My sister had prints made of these family photos for all of us and I finally ordered a beautiful magenta linen to make custom mattes for them. Stunning 1940's family in India, right? Happy Birthday Thakuma! I spoke to her this morning on the phone, and it seems they were well into a party to celebrate! We miss having you close enough to visit often, but you are always in our thoughts. Obviously India is frequently on my mind, as I draw a lot of inspiration creatively from my Dad's culture. We also try and incorporate Indian traditions and meals into our family life. This past week, it seemed that around every corner there was something literal, directing me to have India center stage on my mind. It all started when I came across the Learn Hindi CD set I bought a few years ago that I have yet to use. I was unpacking boxes in my soon to be home office space, and decided that these really could be fun especially with the boys. Foreign language learning during carpool? We already spend most of the time in the car listening to the soundtracks of Monsoon Wedding and The Darjeeling Limited, two of my favorite movies. A day later my mom was here spending a night with us and we managed to get out to an antique store, our favorite local bookshop and pick up Indian food between shuttling the kids to school and soccer. At the antique store we came across these painted Indian clay statues above. I believe they are the Hindu gods: Ram and Sita. While I am a practicing Catholic, I was raised in a family with a Catholic mom and Hindu father. We grew up in a neighborhood with Jewish, Muslim, Hindu, Sikh and Christian neighbors, even on the same small cul de sac. If I could remember someone who was Buddhist, we would have had all five of the great world religions represented. We attended both cultural and religious celebrations within this community and it allowed us to grow up with an understanding and respect for differences and common ground. I never realized how lucky I was to be exposed to so many religions first hand, but I do now as I have children of my own. And to think that this was all in a small, Midwest town! What a reminder this is for all, that we don't have to be in a big city to experience different cultures and religions. I didn't grow up having the Little India, or the Chinatown of a big city with events and festivals, we had families who shared meals and celebrations with us and we all welcomed each other into our homes. That is a much bigger impression on a child in my opinion. The way we create an understanding and mutual respect for different religious beliefs and cultures comes from the family first, then your community around you, big or small. I sat down with the British Vogue I bought at the local bookstore and opened up to a beautiful spread on Rajasthan, full of color and culture. So many artists and designers draw inspiration from India, and I notice it more and more. And to top off the evening, the weather changed from warm and muggy to cool and breezy, like many of the days traveled in India. I felt myself looking for a shawl to wrap around my arms as I headed out to pick up the boys from school. My mom picked up this shawl for me while she was visiting Scotland. The colors are a perfect marigold yellow & Rajovilla pink. Have you ever had a day or two like this? Where everything feels so literal and reminds you of something, or some place? It was like each of these things awakened my senses to something nestled in the back of my mind, moving it forefront and center stage. Before his travels to India, my Dad always asks us if there is anything for him to bring us. While my mind could always think of many, many items, this time I asked for something from the kitchen at Rajo Villa, like a spice bowl or a chapati board? We will see what he finds, it is a big task for someone like him, he likes "new" items as gifts. Either way, maybe the quest could be fun for him? haha. Oh and are you on Pinterest? I find myself mostly gravitating towards Pinterest & Instagram, and less on Facebook. I like that both Pinterest and Instagram are more fuel for my creativity and with less "noise". I'm actually considering a sabbatical from FB, more on that later. Here is my India Board on Pinterest.